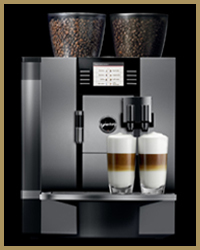 The Jura GIGA X7 is the highest capacity manually filled machine in the Jura range. It uses fresh milk to produce its cappuccinos and lattes, and up to 20 different coffees may be easily programmed. Each drink may be individually tailored to your requirements. The 2 bean hoppers allow customers to use 2 types of coffee bean which in turn may be blended into any drink that you like. 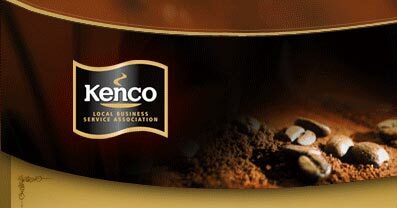 Alternatively you can keep the two types of beans separate and have darker and lighter drink options or even caffeinated and decaffeinated variations � the choice is yours. The machine is fully automatic (one touch of a button to obtain a coffee) and is suitable for sites wishing to dispense up to approximately 200 coffees a day. It is run as a manually filled system with an in-tank Claris water filter. Also available are 2 different milk fridge units that can hold either 3 or 5 litres of fresh milk depending on usage requirements. There is a separate heating system for the milk and coffee delivery systems. The result of using these 2 separate thermo-blocks is that drinks may be made one after the other with little or no down time. 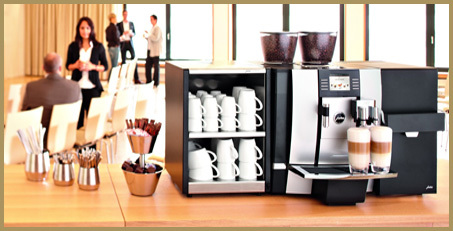 Typically a bean 2 cup coffee machine this small will allow customers to make 2 black coffees/espressos simultaneously. However the Jura GIGA X7 will also permit customers to make milk based specialist coffees such as macchiato, cappuccino or latte 2 at a time. The Jura GIGA X7 is very easy to maintain with simple cleaning, rinsing and descale cycles that may be run at the press of a button. This allows customers to easily manage the daily cleaning routine which is necessary for all bean 2 cup coffee machines, particularly those that use fresh milk. The ease of these cleaning processes means that this system is equally at home in an office as much as a catering environment. 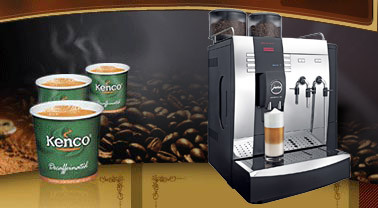 There are other useful features including an energy saving mode that cuts in during periods when the machine is idle and a modular payment unit that may be connected allowing the customer to control costs. We can provide these machines and all of the service support for them that you may require across London, Buckinghamshire, Hertfordshire and Berkshire. Our base just outside of Hemel Hempstead means that delivering and maintaining these machines in the City of London or West End of London is no problem at all.